— The vitals: Jack Campbell left the ice first and is the projected starter in net. He’s faced Calgary once in his career and stopped 35 of 36 shots in a 1-0 loss on November 10. Michael Amadio and Paul LaDue remained on the ice for extra work and are not projected to play, indicating Willie Desjardins will again run with 11 forwards and seven defenseman tonight. (For those wondering, Amadio’s call-up is a standard recall, not an emergency call-up, as confirmed by hockey operations.) Ilya Kovalchuk did not travel with the Kings and will skate at home rather than play on this trip. More on that in a moment. — Their vitals: David Rittich is under the weather today, clearing the path for Los Angeles to face familiar foe Mike Smith, who is 18-9-2 in his career against Los Angeles with a 2.26 goals-against average, a .929 save percentage and two shutouts in 30 games. Calgary averages 3.57 goals per game, a scoring rate bested only by Tampa Bay. They’ve outscored their opponents 169-136 in five-on-five play and 109-58 in third periods. They’ve averaged 4.71 goals per game over their 6-1-0 stretch. Five players have recorded at least 70 points on the season with seven games to play. 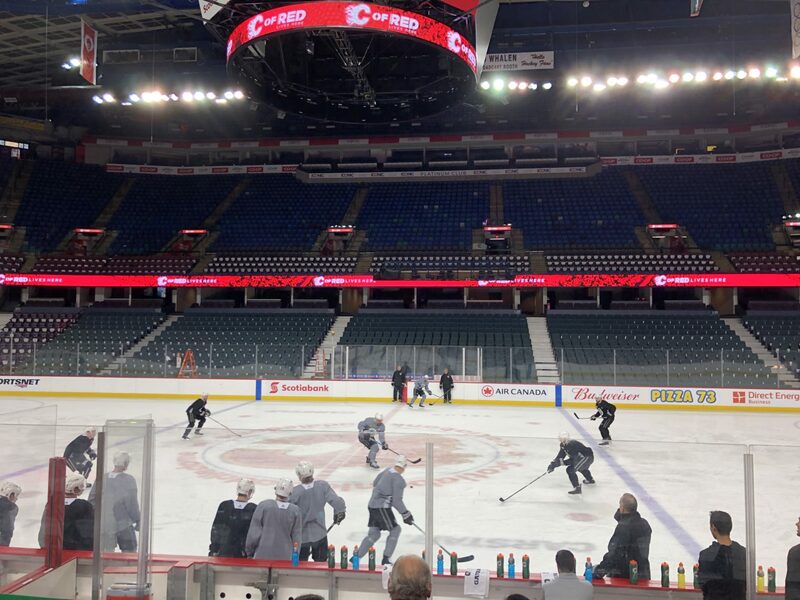 Via Sportsnet 960’s Pat Steinberg, they should line up with Gaudreau-Monahan-Lindholm, Tkachuk-Backlund-Frolik, Neal-Jankowski-Czarnik and Mangiapane-Ryan-Hathaway up front and Giordano-Brodie, Hanifin-Hamonic and Fantenberg-Andersson on the back end. They’re being cautious with Sam Bennett (upper-body), who has a minor injury and won’t play tonight. Doughty also praised Norris Trophy favorite Mark Giordano during the scrum, according to Sportsnet’s Ryan Leslie, but yeah, those comments will draw some attention. Tune in to see what should be an emotional game between a pair of divisional rivals who’ve rubbed each other the wrong way in recent seasons. –Ilya Kovalchuk didn’t travel with the Kings this week. Per Rob Blake, he remained back in Southern California, where he’ll get additional on-ice work with the team’s development and skills staff at Toyota Sports Center. That often happens when a player is coming back from an injury and isn’t quite ready to travel, and Brendan Leipsic (lower-body) will also skate with the on-ice group. That doesn’t apply to Kovalchuk, who is healthy but has been held out of the lineup for three of the last four games. The decision was apparently based on a conversation Kovalchuk had with Blake with the context that it wasn’t expected that he’d play on the three-game road trip, which continues Tuesday in Edmonton and concludes Thursday in Vancouver. “That’s what he wanted. He came up with the idea,” Blake said. With it shaping up that he wouldn’t likely get into any action on the trip, and with the lack of practice time during the three-in-four stretch, the impetus behind the agreement, per Blake, was to provide Kovalchuk the “best possible times he could work on our game, and that’s what we came up with.” As noted, the Kings will use the 11/7 forward/defense alignment tonight, the third game in a row Los Angeles substituted an extra defenseman for a forward. This wasn’t the first time the idea of such an arrangement had been proposed. “We had briefly talked about it before, but [Kovalchuk and Blake] sat down and talked and just felt that was probably the best thing moving ahead,” Desjardins said. There isn’t a great deal of precedent with such a decision, though so many of this season’s coarse and uncomfortable moments have defied recent precedent. Signed to a three-year, $18.75-million contract last summer, Kovalchuk has 14 goals and 31 points in 60 games. — Oscar Fantenberg flew under the radar as a trade deadline acquisition, but he’s been steadily doing in Calgary as he did in Los Angeles: going about his business without much fanfare or attention, and drawing praise from his coaching staff for doing so. To hear Fantenberg re-tell the story of learning about his trade in Tampa because of persistent knocking at his door that interrupted his pre-game nap – he thought it was the cleaning lady before realizing it was a member of the team’s staff after checking his phone and seeing he’d missed two calls from Blake – you can click here for our conversation this morning. But he’s now acclimated in Calgary, where he has one assist and a plus-four rating in 10 games and has appeared in eight games in a row, six of which were wins. He credited his defensive partner, Rasmus Andersson, at helping him get comfortable to craft a role to the best of his ability. “Well, Tre Kronor, right? It’s in the blood, so now you’ve just got to get the reps,” Peters said. Fantenberg had a smile on his face when asked about the emotional stakes of Kings-Flames games and going against his ex-teammates for the first time. “You don’t want to lose any battles out there, that’s for sure,” he said. In 56 games overall, Fantenberg has two goals, four points and a plus-two rating. — More to come from Calgary, Insiders. I’ll be joined by Alec Martinez on the bench before the game and will join Patrick O’Neal during the second intermission to talk about several Los Angeles NCAA prospects and free agent targets. We’re planning prospect updates through all three games on this trip, so come for Doughty-Tkachuk, and stay for Cole Hults, Mikey Anderson and many more names you’ll be interested in. Tonight’s officials are referees Jean Hebert and Steve Kozari and linesmen Brandon Gawryletz and Scott Cherrey. Enjoy your Monday, Insiders, and stick taps to the Traveling Queens – who were graciously saluted in the hotel lobby by Blake and Dave Lowry yesterday – for their excellent road support this season. Let’s talk soon.